At Backtime we hate to say we told you so (actually we love it but we try to feign modesty). Now there have been several predictions made in this forum, and many have been abject disasters like our NCAA Tournament brackets or Heisman Trophy winners. But when it comes to NFL policy change, we were on the money. I posted a column on Savannahnow.com and submitted it to espn.com late in 2008, on how the college football Overtime system was a joke and the NFL's just needed some slight tinkering. 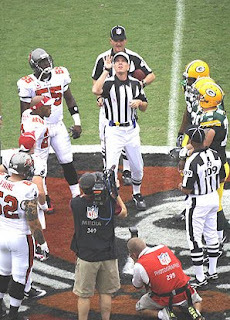 The NFL overtime system is often criticized since both teams are not guaranteed to possess the football. The powers that be would tell you that the NFL is for tough guys, so you’d better take control of your own destiny and finish the thing in regulation or you may not get the ball. It’s not an equitable system like college football in which each team gets a possession. Right? Wrong. The college football overtime isn’t football. Starting 1st and 10 on your opponents’ 25-Yard line is a video game. All stats count in scoring situations which often lead to score totals that approach a college hoop game. It puts records in jeopardy, and the final score is often no indicator of the way the game went. Worse than that, football staples like clock, field position and special teams have virtually no meaning. If you’re the punter (unless you’re also the holder) - you might as well hit the showers. If you’re a return guy – take the rest of the day off. By eliminating the specialists, you turn a game of chess into a game of checkers. It’s a hockey shootout on field turf. So the college system doesn’t work either. But both teams need to have a possession, right? Here’s the plan for both college and pros: One overtime period (15 minutes or 12 or 10). 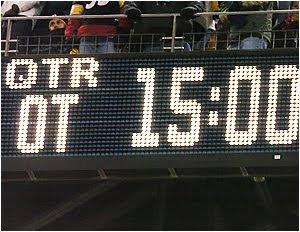 First team to 6 points wins, or whoever has the most when the clock runs out. If Team A wins the toss, and they come down and score a touchdown, they win. Team B won’t be killed by a field goal, but they’ll have to answer. If they allow a TD, they don’t deserve the ball. Most importantly, the Touchdown is the walk-off Home Run. It’s the exclamation point. Not the question mark. And there’s a world of strategy involved. It’s 4th Down, if you punt – will you ever get the ball back? If you make the Field Goal, do you squib it or kick deep? There are coffin corners and 2-minute offenses, safeties, and ties, yes the dreaded tie (obviously in Bowl games or Playoff games, you play multiple OTs if unsettled). If two teams play 60 minutes to a deadlock, don’t take the coaches off the hook. They need to work overtime too.